When it comes to selling your home, looks matter. 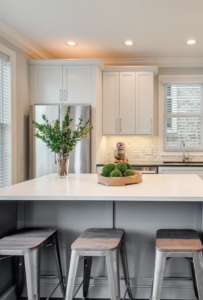 You need to keep your space looking clean and clutter-free, but updating your home’s design can also make a huge impact on how buyers respond to your house. You could even end up selling your home for more money with the right cosmetic updates. Here are some trends to help make the biggest impact on potential buyers. Stray away from bold, bright walls. Stick to natural, neutral paint colors. These colors look better in listing photos, and they will also be more versatile for the new owners. Light beiges and powdery blues will be easier for new homeowners to adapt to their style of design and decor. They’ll be able to envision themselves living in a space that already seems to ﬁt their own decor. Shades of blue are big for today’s home buyers. 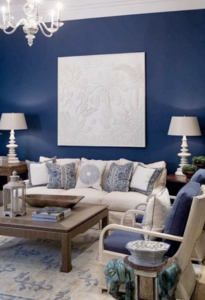 If you’re staging your home, consider getting blue throw pillows, rugs, or other decorations for your living room. You don’t have to over-commit to the color scheme by painting your walls a bold shade of azure. Start small and keep adding until the accents are noticeable, but not overpowering. While updating your pallet will help boost your home’s value, it’s important to remember that color isn’t the only thing that peaks a buyer’s interest. Updating the kitchen or bathroom is a great way to make your home more attractive. This can be as simple as installing new hardware or adding artwork. Updating ﬂooring and countertops is also a good idea. Want to know the value of your home? Click HERE to find out today! Realtor Magazine notes, “Upgrading a home’s landscape from average to excellent can raise its overall value by 10 percent to 12 percent.” Consider adding a splash of color with bright, seasonal ﬂowers and plants that hug the border between your house and the yard. 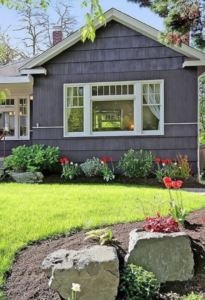 Curb appeal is the ﬁrst impression that your home makes on a potential buyer. Make sure your home looks clean and structurally sound from the outside. Look out for cracks in the pavement and dry patches of grass on the lawn. 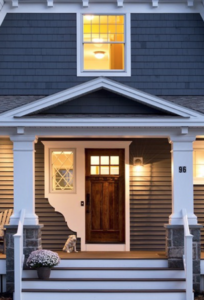 Landscape, updated porch lights, and a reﬁnished deck will make a big impact on a buyer’s overall opinion of your home.